They aren’t local, they aren’t aliens, and they might help us understand dark matter. Fast radio bursts (FRBs) are blasts of radio energy that last for only a fraction of a second but are extraordinarily bright. Because of their short duration, and the fact that the same FRB never repeats, they’ve been very difficult to study. They were first discovered in 2007, and for a while they were observed only at the Parkes radio telescope in Australia. Because of this, and the fact that FRBs were so incredibly bright, there was a great deal of speculation that they could be due to local radio interference rather than some new astronomical event. In fact a similar short-burst phenomenon known as perytons were found to be due to stray signals from an unshielded microwave. Fast radio bursts are somewhat different from perytons, and have two distinct features that imply they are distant in origin. The first is that rather than being a simple burst with a range of frequencies happening at once, the frequencies are spread out, with higher frequencies arriving first and lower ones later. This whistler effect is characteristic of a pulse that has traveled through the interstellar medium. It occurs because when an electromagnetic pulse interacts with charged ions, different frequencies are slowed by different amounts, with the lower frequencies slowed down more. So you get a dispersion effect. Stray bursts or chirps from terrestrial sources generally don’t have the same dispersion because they don’t travel through plasma and they don’t travel far. The second is that the bursts seen by a single radio detector rather than a range of nearby detectors. This implies it comes from a particular point in the sky rather than somewhere near the telescope. Unfortunately radio telescopes are not good at determining an FRB’s location in the sky. This makes it difficult to determine their cause. This led to a great deal of speculation about their origin, including the idea that they might be due to some alien civilization. Combined with the fact that perytons were caused by a microwave, FRBs began to take on a fringe science status. 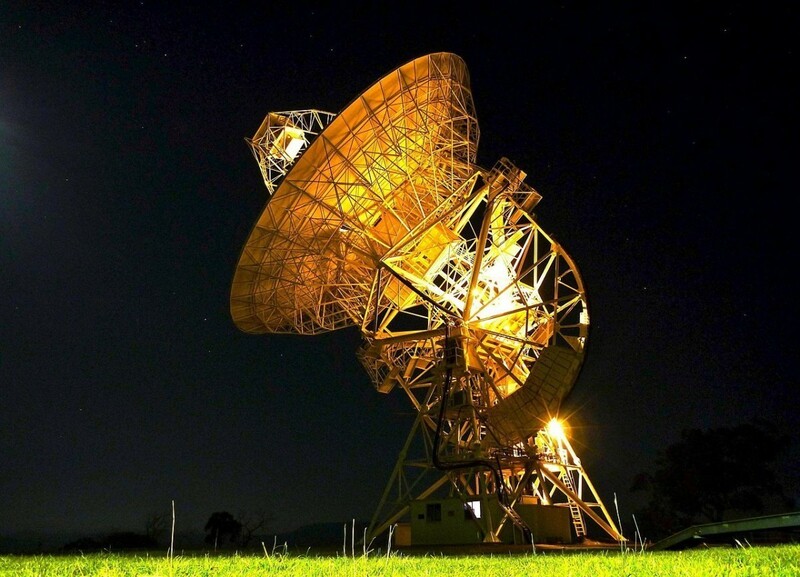 But recently the Parkes observatory detected a fast radio burst, then two hours later the Australia Telescope Compact Array in New South Wales saw a fading radio glow in the same region of the sky. Using the two observations to triangulate its position in the sky, a team of astronomers narrowed the source down to an elliptical galaxy 6 billion light years away. To verify this source the team compared the dispersion effect of the FRB signal with the amount of ionized material between us and this particular galaxy as estimated by the WMAP probe. The amount of frequency dispersion agreed with the estimated amount of ionized material, indicating that it did indeed originate from the distant galaxy. Now that we know they are real astrophysical events, the next step is to confirm their cause. The leading idea is that they are due to neutron stars, either through neutron star collisions or perhaps when a neutron star collapses into a black hole. They might also help us solve the mystery of dark matter. In order to better understand dark matter we need to know exactly how much faint regular matter there is between galaxies. Since the dispersion measure of FRBs gives us an excellent measure of the amount of material between us and a particular distant galaxy, they can be used to help map the distribution of faint matter throughout the universe. There’s still much to learn about fast radio bursts, but this recent work brings them clearly back out of the fringe. Paper: E. F. Keane, et al. The host galaxy of a fast radio burst. Nature 530, 453–456 (25 February 2016).